The baseball peak supposedly comes between 27 and 29, when a player's flower garden of skills, body, and spirit all bloom at once. They see pitches better, swing harder, and run faster. If you're going to have a "best of your career" year, that's when it'll come. So they say. To sniff-test that idea, I ran the top 5 age 28 seasons by OPS+ and each belongs to an all-timer. Indeed, that search's top 20 is all current or potential Hall of Famers, excepting the injury-shortened career of Albert Belle (full Baseball-Reference list). In other words, duh! Great players have great peaks. Russell Carleton of Baseball Prospectus dove further into That Peak Age Thing back in 2010. His conclusion: "peak age" is more complicated, especially for management purposes of signing players to contracts and expecting to reap several years of "peak play." My philosophical conclusion: it's good to both be in your late 20s and have the introspection to enjoy being in your late 20s. 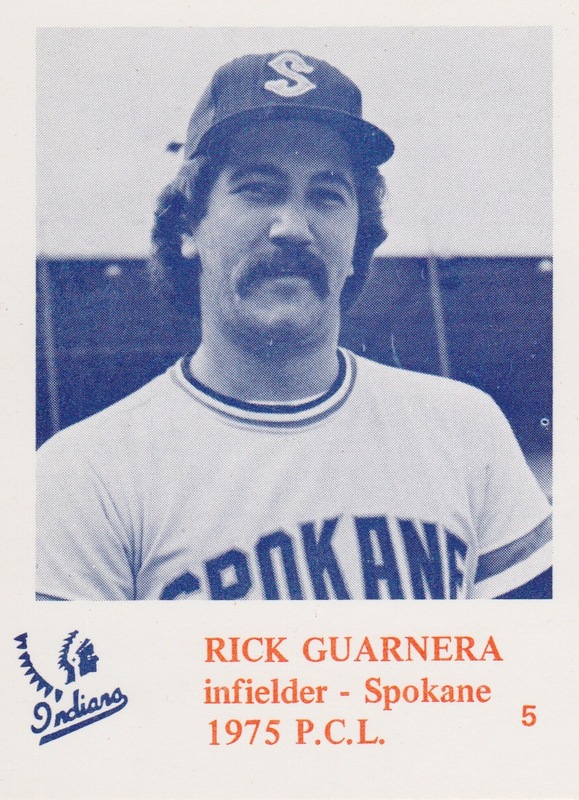 This question came to mind because Rick Guarnera turned 28 in 1975, his final pro season. He'd logged 3 years each at A, AA, and AAA, averaging a low-power .250 and playing anywhere they needed a fielder. He made the 1972 Senators-to-Rangers franchise move without changing teams, as their AA affiliate remained in Pittsfield, MA. Rick's "that guy" teams hang onto to fill roles, provide veteran guidance for fast-rising younger prospects, and (who knows?) bloom late. When that didn't happen by 28, Rick and the Rangers went their separate ways. #6 is the same Roy Smalley who went on to excel for several teams, but as a young Mariners fan, I'll forever remember his "impact" on Mike Parrott's 1980 season. Value: This #5 cost $3 at MinorLeagueSingles.com. The presence of Smalley, Rick Waits, and other teammates with decent MLB careers make this a higher-demand team set, but I haven't seen enough listings to estimate a value. Fakes / reprints: This simple design's easy to fake, but I haven't seen any in the marketplace.